When the Sony Reader first caught my attention it was over £200. 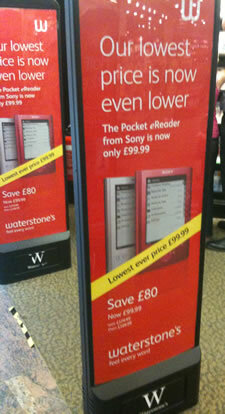 Today you can pop into Waterstones and get one for just £99! This is quite a dramatic price drop and as a result I suspect quite a few more people will consider purchasing one of them as an impulse buy. The more net savvy consumers are probably likely though to purchase the £109 Kindle from Amazon that does a very similar job but also comes with WiFi. Though some people will wonder about buying a dedicated e-book reader, there are many advantages to these devices for users and learners. One way to think about ebook readers is thinking about how mp3 music players, such as the iPod, fit into our lives. Yes we know listening to CD or vinyl on a dedicated sound system is always going to be a preferable experience to listening to music through earbuds on an iPod. Yes we know that we can play music on our desktop computer and it has a lot more storage than any iPod! Yes, it is entirely possible to copy your music collection to a laptop and carry that around with you so you can listen to it any location. Yes listening to the Now Show live is nice on the radio, even though we know we can download it as a podcast. What the iPod brings is a combination of convenience and access that is different. The ability to play music when and where we want to is what makes it different, a dedicated stereo system is great for music, but it’s not portable. It’s not always easy to use a computer to listen to music, for example while on a bus, again the iPod makes life easier if you want to listen to music while travelling. Podcasts of radio programmes again make it easier to listen to shows such as the Now Show, the News Quiz at a time and place to suit us, which may not be when the show is broadcast. Despite the quality and storage arguments, I suspect most people reading this blog have an mp3 player or an iPod. eBook readers are not there to replace books, they are useful in providing a reading experience at a time and place to suit the reader. Yes paper books have their advantages and can be a wonderful reading experience, however try carrying ten or more at any one time. Being able to access your library whilst travelling, on holiday, anytime on the move is what makes the eBook Reader so compelling. With the Kindle the ability to quickly download a book when you want to read it is a real advantage over buying paper books that would either normally require a visit to the bookstore or ordering from Amazon. Though it is possible to read e-books on a computer or a laptop (or even an iPad) the e-book reader isn’t there to replace that experience, but allow a more portable way of carrying and using e-books. I have all my music on my iMac, but I still use an iPod to listen to music. Likewise I may read e-books on my laptop, but having those books on an e-book reader is an addition to how I use e-books not a replacement. I can use my e-book reader alongside my computer so that it acts as a reference device, in the same way I currently use paper books when writing or researching on the computer. I do believe that e-book readers have their place in how we access information and knowledge. I do think at this time we don’t know how best to use those e-book readers and as with music and video these new ways will arrive over time. At around a hundred pounds, e-book readers are going to be much more affordable and I can see many people finding one under the Christmas Tree come December. Some will ignore it, some will sell it on eBay, but many I believe will start to use it and use it a lot to read books. This entry was posted on Wednesday, September 1st, 2010 at 9:20 am and is filed under e-book, ebook, kindle. You can follow any responses to this entry through the RSS 2.0 feed. You can leave a response, or trackback from your own site. Maybe we should consider some of ebook history (and yes there is one, especially if we consider Vannevar Bush’s Memex concept in 1945 as an early forerunner) with the idea of dedicated vs. multifunctional ebook devices…think of the demise and reincarnation of devices such as the Sony Data Discman, Rocket ebook, Franklin eBookman etc. We are certainly a lot further forward since those second and third generation devices but are dedicated devices the way forward? And is technology (and society) yet at a point to embrace them further as well? I know I’m playing devils advocate here and as an impassioned supporter and researcher of ebooks since the late 90’s I certainly bear them no ill. I just think these are areas that can make interesting discussion.